letbeautybeyourconstantideal Beauty Interprets, Expresses, Manifests the Eternal: Do I Feel Rich Today? Today on this World Environment Day, I certainly feel rich! I feel rich when I see the beauty and blessings of Mother Nature in my little garden. Today I remember the little sapling of Rangoon Creeper that we had planted in a little corner of the garden a couple of years ago. I also remember how just a few weeks later, it accidentally got pruned while digging out some of the intruding weeds that had shown up nearby. I remember how sad I felt when I noticed that only a little bit of the root and a couple of leaves of the sapling survived the 'accident'. I remember how we nursed it and took care of it for the first few days after it was replanted. I also remember that once the plant was firmly rooted, we basically left it alone to do its own thing. Just gave sufficient nutrition but not too much. Gave enough love, enough space, enough support for the vine to climb up, and then let it grow at its own pace, to blossom in its own time. Today I feel rich when when I see how profusely it is blooming. Those bunches of mildly fragrant blossoms drooping over the garden wall, those little red-pink-reddish-pinkish blossoms which have been a special favourite since childhood. Today I feel rich when I remember how fun it was to make beautiful flower garlands with these blossoms sticking one tender-light-green stem of a blossom into another. 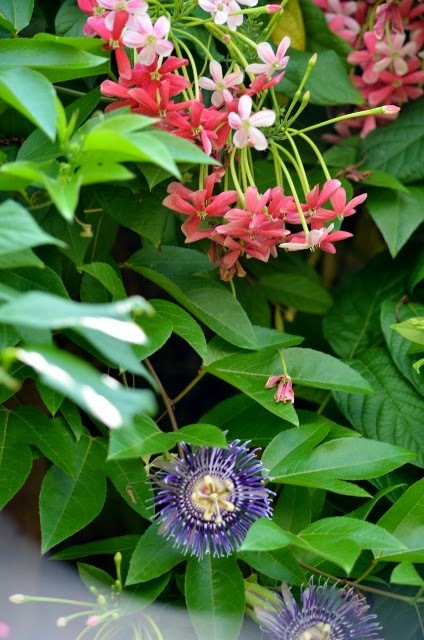 Today, I feel rich when I see Pasiflora (Passion Flower) blossoming next to the Rangoon Creeper. I have written here and here about the work we have had to do to allow these two vines to find a comfortable harmony with each other. Today I feel rich when I realize that some of those "lessons" in harmony are bearing fruit. Or flowers, I should say. 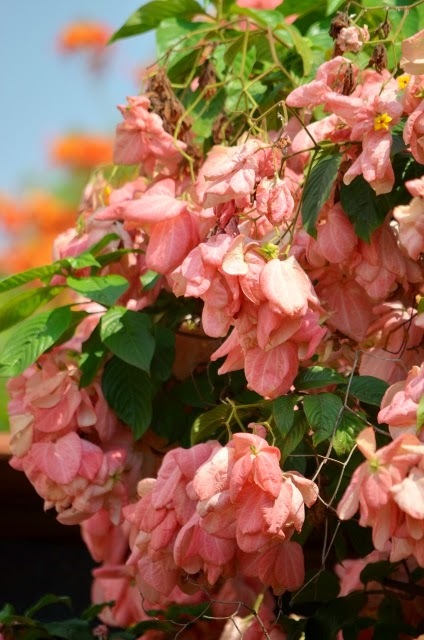 Today I feel rich when I see the tender leaf-like pink blossoms of Mussaenda (Bangkok Rose) swaying gently on the shrub which had almost half-died under its own weight one evening which brought heavy rainstorm and furious winds, almost a year ago. I remember how we tied together some of the drooping limbs of the bush, giving it enough support with bamboo sticks till it was strong enough to stand on its own. I also remember how just a few months ago part of the bush was beginning to show serious insect-damage. I remember how sad I felt realizing that I had ignored the plant and not given its necessary fix of the neem-oil-water-mix spray to get rid of those pesky little insects. Today I feel rich when I see the bunches of these leaf-like flowers in soft pink shades, with little centers of deep yellow shining through them. Today I feel rich when I realize that a regimen of proper care and timely attention does bear its fruit. Or flowers, I should say. Today I feel rich seeing the bluish-purplish blossoms on the just-over-two-year-old bush of Ironwood/Delek Air tree/Anjan (Memecylon umbellatum). I remember the day we had planted just a tiny little sapling of this bush. I remember how I had even forgotten that we had planted this, until my husband showed me the spot where it was. I remember how happy I felt seeing that it was doing well, slowly growing and becoming stronger. I remember how relieved I was to know that perhaps the best way for this plant to grow was to be left alone without much interference from the human hands. I remember how many times I have had to remind the gardener, who is less of a gardener and more of a water-giver, to not water that corner where this woody shrub was beginning to take its hold and show some progress. 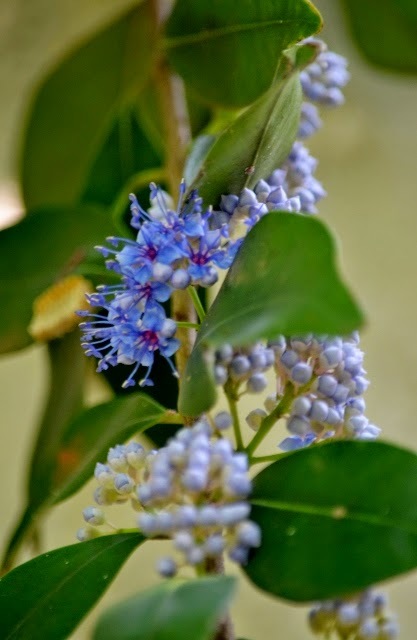 Today I feel rich when I see the leathery green leaves and the mildly fragrant beautiful blue blossoms. Today I feel rich when I realize that sometimes all that is needed is to carefully drain out and remove the excess life-energy so that a harmonious blossoming can occur. Today I feel rich when I realize that a garden can be one of the best teachers one can have. Today I feel rich when I realize that a little bit of effort in our own backyard can go a long way. Do something for our Mother Earth today. Celebrate World Environment Day! 1. 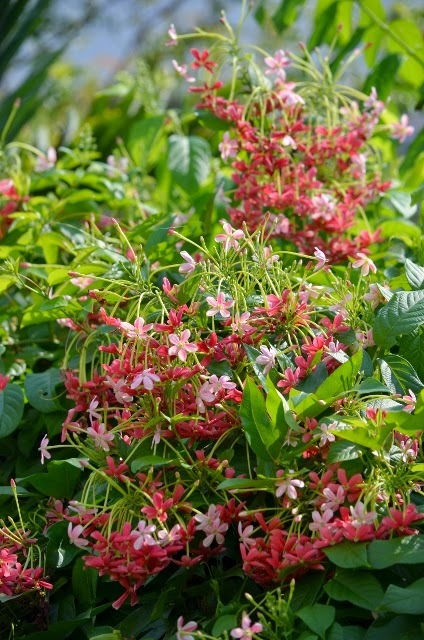 Rangoon Creeper - Faithfulness: We can count on You; You never fail us when we need You. 2. Passion Flower - Silence: The ideal condition for progress. Written in response to the Indiblogger InSpire prompt - Rich: Write a post on your interpretation of this word. Was inspired to write this after a dear friend reminded this morning that today is World Environment Day. "All Art is Quite Useless": What a Wild(e) Idea!